Inspired by the vibrant and eclectic markets of Morocco, the Nomad collection by Nourison shows off rugs which would be right at home amongst the stalls and carts of Marrakesh. Richly patterned in simple tribal designs, as well as more intricate offerings, the Nomad range combines a bold array of different elements to make them stand out. Vibrancy is key to each Nomad rug and this is what they offer to any room in the modern home. 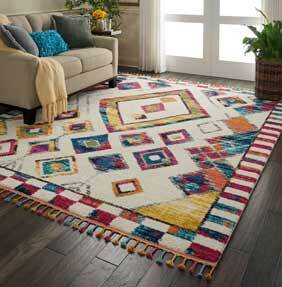 Tasselled fringes and bold geometrics make every rug in this range a statement piece. The soft, low shag-pile textures ensure great comfort and additional warmth, as well as a touch of bohemian spirit in any room that calls one of the Nomad collection rugs home. Each Nomad rug is machine woven for quality control and crafted from 100% durable polypropylene fibres.